I suppose someone liked the image I did of an alternative version of the Mark 6 Spartan suit based on what Master Chief wears in Halo 3. 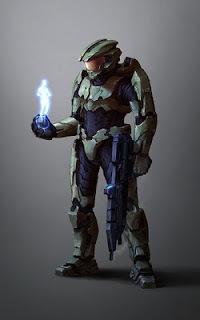 Someone actually went ahead and wrote some fan fiction about it on a Halo wikipedia saying that it's the Mark 7 Spartan armor. Strangely, I wrote 117 which is the code number for Master Chief on the shoulder. As well, in the ending of Halo 3, Master Chief is lost in space. So however he got a Mark 7 armor is beyond me. this is amazing but, just to say, his mid section needs to be longer his,COD piece, i think, looks a bit like a thong needs to be squared. but damn awesome helmet dude!